Visit our new locations in Wilson, NC and Pittsburgh, PA! The Mystical Psychic Reader is a gifted psychic advisor, and spiritual couselor, born with exceptional extra-sensory perception. With her highly perceptive clairvoyance, she has helped people from all walks of life, and all parts of the world overcome problems and obstacles in their lives in order for them to enjoy their life, and fulfill their highest purpose. Her psychic readings are very accurate and insightful. Her energy healings have a profound and positive impact. Her work has led her to California, New York, Alaska, The Virgin Islands, North Carolina, and Florida. She performs remote psychic readings and energy healings, in person, over the phone, or by mail. 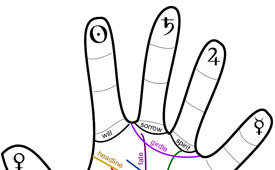 Palmistry or chiromancy, is the art of characterization and foretelling the future through the study of the palm, also known as palm reading, or chirology. Learn more. Energy healing is based on the belief that a healer is able to channel healing energy into the person seeking help by different methods: hands-on, hands-off, and distant where the patient and healer are in different locations. Learn more. Tarot reading revolves around the belief that the cards can be used to gain insight into the past, current and possible future situations of the subject. Learn more.